With the advent of Etsy and other crafty websites, lots of couples are choosing boutonnieres that will last a lifetime. My favorite is Fritts Rosenow Bespoke Boutonnieres, a branch of Rosenow Floral Designs based in San Francisco. 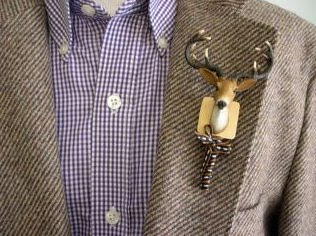 They have boutonnieres of every imaginable theme, and if you don't see the perfect thing, just contact them. Skis, Yodas, bird's nests-nothing is too outrageous. I mean, that 8 point buck is genius! And of course, they also do beautiful silk flowers, for a more traditional groom (or bride).